Adobe Air platform probably has the most number of Twitter clients. Adbobe AIR is a new technology that brings web applications to your desktop via a familiar desktop app like interface. 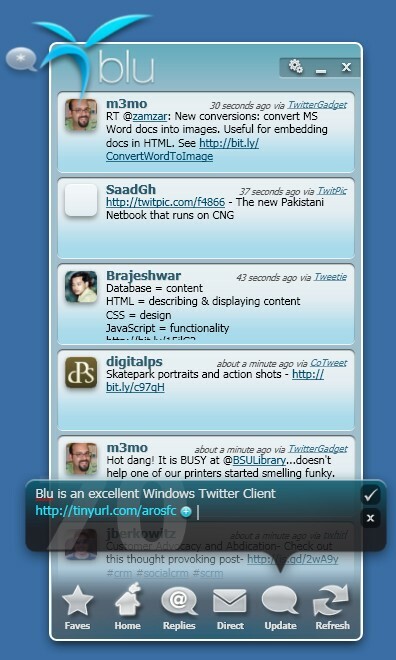 A few popular Twitter clients on Adobe AIR are Twhirl, TweetDeck, DestroyTwitter, Seesmic, etc. I used Twhirl for the longest time and since converted to TweetDeck after it started supporting multiple Twitter accounts after a nudge from my buddy @MattJabs. If for some reason you are looking for a non-Adobe AIR Twitter client for your Windows desktop, I just came across a stylish new client. Blu is a .NET based Windows desktop Twitter client developed by thirteen23. Blu has a fun and stylish instant messenger like interface. Plus, it has ample transparency effect to blend very well with your Windows Vista or Windows 7 desktop. It works great in my Windows XP as well. Let’s look at a few features that sets Blu apart from the others. User Profile – Just click on a user picture to see their profile with their Twitter stats. You can favorite, follow/unfollow and block user. Replies – Replies tab shows your replies. You can follow the conversation easily by clicking the blue arrow by the user name to see your previous tweet. To Reply, just hit the reply arrow. It even remembers your scroll position when you switch back! Direct Messages – tab shows your direct messages. It sports Message and delete buttons. TinyUrl integration – Just add your link to the tweet as you are typing and it is automatically converted into a tinyurl link on the fly. No need to push a button or put your url into a separate box! Settings – A settings tab to turn on/off – audible tweets, auto login, log your twitter sessions, custom proxy support, client opacity, refresh frequency, etc. Faves – As you are tweeting, you can click on a user picture and add them to your faves to quickly follow certain people’s tweets easily. Any tweet, on clicking, flips to become a Twitter update box! Blu is a minimal Twitter client that offers enough features for a regular Twitter user. It may not offer as many features as the other Adobe Air stalwarts but could be an invaluable replacement where you can’t run Adobe AIR for some reason. Personally, for me to use a Twitter client I have come to require certain features that makes it very efficient to Twitter. Search tweets and users, bit.ly/ow.ly url shorteners support, multiple account support, some form of font/color customizations, etc. But, Blu will definitely satisfy if your needs are simpler and if you are looking for a lightweight alternative. If you are looking for a professional Twitter client, check out my HootSuite review.